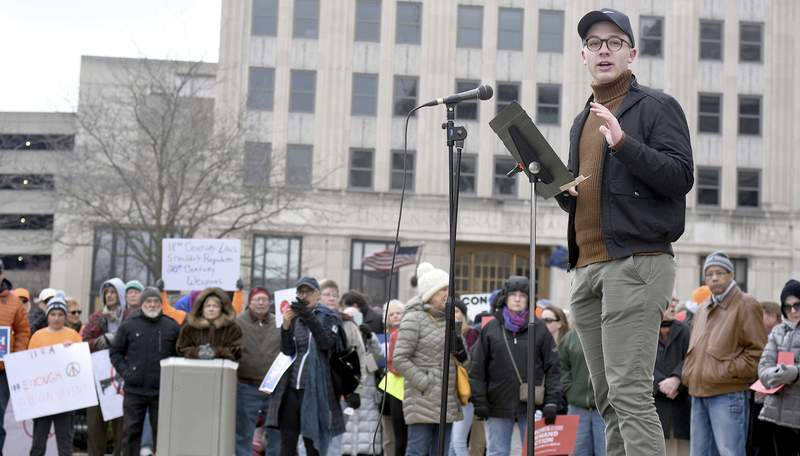 Photos by Rachel Von | The Journal Gazette Attendees at Sunday's rally listen as Fraser Coffeen, a middle school administrator, speaks at the Allen County Courthouse lawn. The student-organized event stressed politicians taking action on gun control. Maren Stewart was one of many people to bring a homemade sign the protest. Rachel Von | The Journal Gazette Organizer Brandon Blumenherst, an IPFW freshman, speaks during the rally. Blumenherst’s hope that 150 students and community members would attend the event was surpassed. 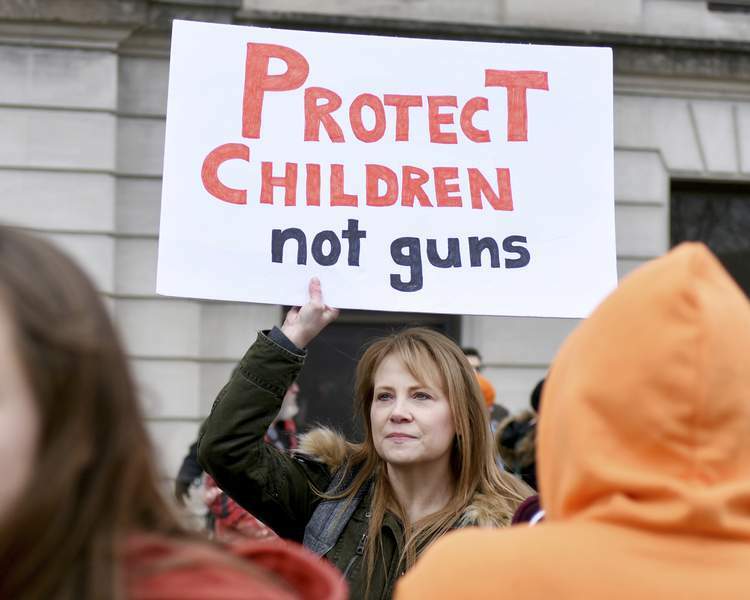 Eleven days after a Florida school shooting left 17 dead, hundreds gathered on the Allen County Courthouse lawn demanding action to prevent gun violence. “Thoughts and prayers are good, but they're no longer enough,” Homestead senior Panashe Chakabva said Sunday to a diverse crowd that included young children and educators. She urged politicians – specifically U.S. Sen. Marco Rubio, U.S. Rep. Jim Banks and President Donald Trump – to demonstrate leadership. “Do your jobs,” she said. The student-organized rally mirrored demonstrations happening nationwide. The mass shooting at Marjory Stoneman Douglas High School has spurred student survivors to demand action on gun control and has prompted calls to action at schools nationwide through walkouts, sit-ins and other demonstrations. 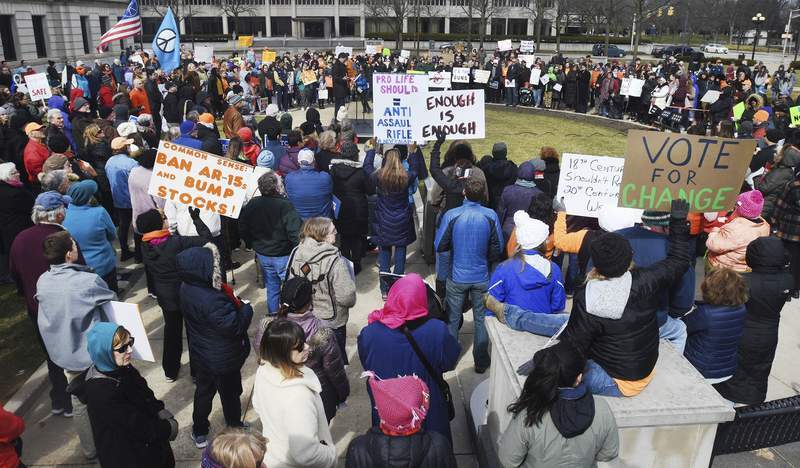 “We want to stand in solidarity to show folks we are sick and tired of these students' lives being lost because of Congress' unwillingness to address issues like this,” organizer Brandon Blumenherst, an IPFW freshman, previously told The Journal Gazette. Some attendees also wore orange in solidarity with the Wear Orange campaign, created to help prevent gun violence. Speaker Ritvik Bonam, a Carroll senior, called on lawmakers to protect children. “We cannot expect change unless we demand it ourselves,” he said. Fraser Coffeen, a middle school administrator, said elected officials shouldn't ask schools and students to fight a battle they, the politicians, won't fight. With a table at the rally, Moms Demand Action for Gun Sense in America gave participants an opportunity to send postcards to lawmakers about gun legislation. Addressing the crowd, City Councilman Geoff Paddock, D-5th, called for a stronger relationship between local law enforcement and schools, advocating for more security to protect teachers and students. Chakabva's demands addressed background checks and assault weapon sales. “Guns are not the price we must pay for freedom,” she said.